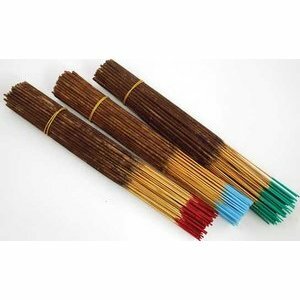 The sweet scent of vanilla is blended with light, fruity touches and a gentle musk within Vanilla stick incense from Auric Blends, creating a decadent scent that is perfect for creating a stirring atmosphere within your home or sacred space. Sweet and confectionary, vanilla is also widely used with love spells, and spells of passion. Each pack comes with approximately 90 - 95 sticks of alcohol and charcoal free incense.